It’s hard to create a movie when you already know how everything is going to end. Leave it to Clint Eastwood’s, “Sully” to challenge you from the very first scene about your real understanding of the “Miracle On The Hudson” landing in 2009. And that’s quite an accomplishment. To create a story that has to last longer than the ill-fated Flight 1549 actually did takes some dramatic craftsmanship. So, using Captain Chesley “Sully” Sullenberger’s book as the primary source material, the heart of the movie is the guessing/second-guessing of Sully and the consequential impugning of his ability and judgement. On one hand, the media immediately anoints him a hero while initial computer simulations reveal the possibility of an alternate ending to the Hudson River ditching scenario. 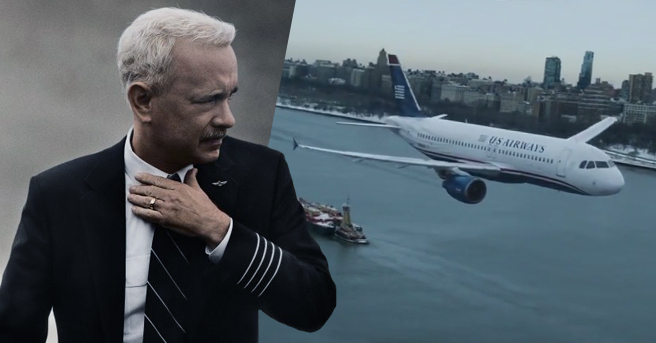 Tom Hanks is his usual pitch-perfect in the title role, embodying the “aw-shucks” humility coupled with the nagging self-doubt that Captain Sullenberger was certainly experiencing as the background investigation unfolds. He literally looks the part. And although overshadowed by the magnitude of the events not being in the pilot seat, Aaron Eckhardt as co-pilot Jeff Skiles gives what we think is the best performance in the film. “Sully” is solid entertainment. There are some visual shocks to be had that are created to jar you from pre-conceived notions. Definitely a date movie but not for those who have a fear of flying. NOTE: At our screening, a couple brought their about 5 year-old child. It did not go well. There will be lots of train rides in their future.